The Kuleshov Effect influences every film and every filmmaker. Understanding it can give insight to “movie magic” and creating the meaning you want expressed in your project. The Kuleshov Effect is the single most important concept to editing, if not to filmmaking itself. It’s a cornerstone of visual storytelling; through this phenomenon that we can suggest meaning and manipulate space, as well as time. It is a fundamental aspect of “movie magic,” one which every filmmaker needs to understand. Lev Kuleshov (1899-1970), was a Russian filmmaker, considered by some to be the first film theorist due to his work dating to the 1910s. Kuleshov asked the question: what made cinema a distinct art, separate from photography, literature or theatre? He found that any form of art consists of two things, the material itself and the way in which the material is organized. Following this logic, Kuleshov found that the organization of individual shots, also known as montage, is what makes film stand apart. 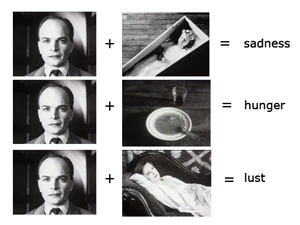 In 1921, Kuleshov set up a series of cinematic demonstrations which gave the phenomenon its name. In these experiments, he projected the face of a well-known actor, then cut to a plate of soup, he then showed another shot of the same actor, then a girl in a coffin, the final sequence was the actor’s face, then an attractive young woman. Audiences responded that the actor seemed in the first sequence to be hungry, in the second, quite mournful and finally seemed to exude lust. In reality, all three shots of the actor were the exact same, his face was interpreted differently based on what it was put next to in the edit. Additionally, even though there was no establishing shot of the actor together with objects from the other shots, they seemed to the audience to be in close proximity to one another. Through the ordering of the shots, two separate places seemed to be one whole continuous location to the audience. Manipulating space and time was possible through the use of editing. This was a huge moment for cinema, with Kuleshov declaring montage to be the central principle that defines film as an art on its own. This was a huge moment for cinema, with Kuleshov declaring montage to be the central principle that defines film as an art on its own. Kuleshov’s theories were instrumental in the creation of a powerful genre of filmmaking, Soviet Montage, which was eventually suppressed under Stalin. But the Kuleshov Effect lives on, exemplified in almost every film or video that we encounter. Understanding the Kuleshov Effect allows editors to better control the tone and meaning found in their films. Through the choices in how shots are organized and sequenced, filmmakers can create new meaning by juxtaposing unrelated images. With the illusion of condensing space, we are able to create new worlds, connecting places that were previously separate. Thus, the Kuleshov Effect is a huge part of the magic that is film. Russian film theorists in the early 1900s were hugely influential in shaping how cinema was to develop. They saw film as a powerful tool of social transformation, inherently political and inextricably linked to the filmmakers’ worldview. Kuleshov’s contemporaries explored the power of montage and their innovations paved the way for contemporary filmmakers. Sergei Eisenstein, promoted the idea that the essential element of all art is conflict. Eisenstein advocated dialectic montage — that a sequence of shots can have more meaning the the sum of its individual parts. He was inspired by his study of Japanese Kanji which juxtaposed two concepts to create a new third concept. Eisenstein’s films “Battleship Potemkin” (1925) and “Strike” (1925) are both classics of Russian cinema. Dziga Vertov eschewed dramatic films as a corrupting influence. An early experimenter in the realm of documentary, Vertov pioneered many modern staples of filmmaking in his newsreels. In 2014, “Sight and Sound” named his film, “Man with a Movie Camera” (1929), the best documentary ever. Taken from an article written by Erik Fritts for videomaker magazine.